I mean what show is more All-American than a show about high school football in small town Texas? Over the weekend, all mention of the campaign mysteriously disappeared from the site's homepage. So we decided to do some digging. According to Viacom insiders familiar with the situation, the campaign immediately began to draw the ire of upper management the second it was launched. 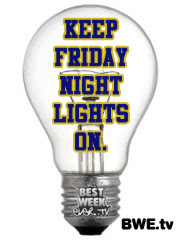 You see, Friday Night Lights airs on Friday nights, the same night that Best Week Ever premieres a new episode each week. Although the shows are not direct competitors, Vh1 production execs were less than thrilled that the flagship site of their new Digital Programming unit was using Viacom funds and bandwidth to promote a show that airs on NBC. The irony here is rich, especially when you consider that the entire concept of Best Week Ever revolves around content generated by sources outside of the walls of Viacom AND includes significant amounts of programming aired on other networks. So, what will become of the campaign? At press time, the answer is not clear.